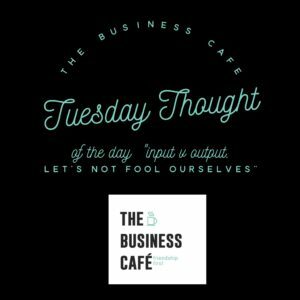 Input Vs Output – how effective are your actions each day? When I was 22 my new boss said to me “I don’t have to manage you, you manage yourself far harder than I could”, he also said “I am only interested in your output, your input is entirely up to you”. Two powerful statements, I remember them 31 years later like it was yesterday. The first was about a work ethic, I guess that meant I was ready to be my own boss, I didn’t discover that until I was 33. The second, was more impactful, and being a business owner, output is something we have to monitor in ourselves all the time. It is very easy to keep busy, always something to do in business to help us go to bed feeling that we have worked hard. The tough bit is considering whether what we did was having impact and would create the outputs for the business that we need. Social Media is one of those tools and activities in our lives that can be amazing and highly productive, or can eat up our time. Networking at events, going to conferences, speaking, organizing our admin, even maintaining an empty INBOX. When I posted my ‘smug comment’ yesterday about stating the week with an empty INBOX, Nigel Stonham cleverly observed, “p.s. is your goal an empty IMBOX or being efficient and effective?”, Nigel is right, what was my motivation, was it to get to the empty feeling or to manage all the emails in a way that made them worth while. If we measured our time as we would if we were employed, we would work out what we were paid per hour and make decisions on whether we were an effective employee, giving the business the return it needed for the skills we gave it. Perhaps a terrifying experience for some of us. Perhaps something we need to do occasionally. Gail Thomas, Co-Founder of The Business Cafe wrote a book called ‘The Gift of Time’, within her pages she talks of effective delegation and ensuring you use your skills to grow your business rather than hold onto the tasks that are skills others have that could do tasks in half the time you take. Roger Hamilton taught me over 10 years ago the power of knowing when “you are in your flame’ or when you are in your wax”. You flame is when you feel you are on fire, life is a breeze and you could light a million candles, your wax is when you are drowning, your light is getting duller”. We can be sure that when we are in wax time we are definitely not going to be achieving the output we need for the business. So today, while I go about my work, I am going to really consider my output. I am even going to mark down the tasks I do that are ineffective input. Then I will look at this as a percentage of my day. I wonder what I will reveal.